Toshiba showed off the benefits of its Ethernet-connected object storage drives at OpenStack Summit 2015. There are two drives on display – a standard SMR hard disk drive with Ethernet connectivity and a hybrid drive that runs a Linux kernel. 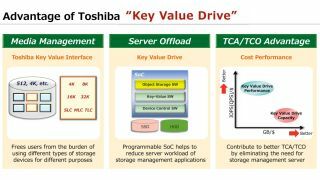 The Ethernet-connected drives offer enterprises significant savings because the number of "servers can be reduced by storage disaggregation," Toshiba highlighted as a benefit of Ethernet drives, which has its own processing unit and network interface, in a presentation. Although removing the servers from the equation will help users save costs, it also presents a speed challenge, as data access won't be able to benefit from the server RAM for metadata caching. To overcome the speed limitation, Toshiba's hybrid Ethernet-connected drive, which uses both solid state and hard drive technologies, runs an open source Linux kernel. The embedded Linux kernel can be used to control the drive. The kernel can be leveraged to cache metadata to the SSD portion for quicker access. Toshiba claims that this "frees users from the burden of using different types of storage devices for different purposes." The hybrid drive fits inside a standard 3.5-inch enclosure and comes with its own SoC controller. The SoC reduces the number of servers required. The drives are open Kinetic-compatible so users can use existing Kinetic drive enclosures. Unlike block and file storage, object storage is configured using a distributed architecture. Each IP-attached drive has its own SoC and acts as a storage node. Users can expand their storage needs by incrementally adding disks. Storage is accessible by key value, which eliminates existing storage parts, such as a block or file system drivers. In turn, this reduces the overhead of the server processor. To increase storage capacity, multiple disks can be pooled together using a RAID controller.